Above the display is where the 2MP front-facing camera and its indicator light can be found. An ambient light sensor and proximity sensor, as well as a microphone are also located there. Below the display, you will find the Windows start button. The tablet's front-facing stereo speakers are there as well. They keep a pleasantly low profile. The 3.5mm audio jack and the charging port are located on the left. They look quite alike at a quick glance. The microUSB and the microHDMI ports are located on the right hand side of the tablet. The power/lock key, the volume rocker, as well as the pop-out tray for the microSIM and microSD card are located on top. The tray is removed via the supplied ejector tool. The proprietary connector for Nokia's keyboard cover sits alone on the bottom. There is nothing else there. 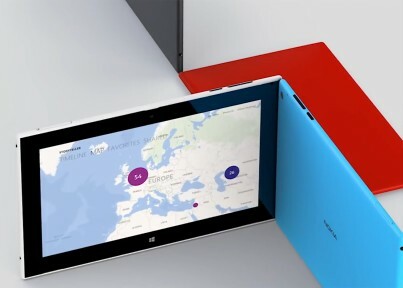 The back of the Nokia Lumia 2520 is home of the 6.7MP Zeiss camera, an NFC connectivity tag, and a couple of logos. Next to the camera sits a secondary microphone dedicated to noise cancellation. Powered by a beefy 8,120mAh battery, the Nokia Lumia 2520 did quite well in our battery test. The Finnish slate bested its Surface 2 relative and scored highly in both the web browsing and video playback section. It must be noted that the web browsing test was conducted over a Wi-Fi network. Should you choose to surf the web over LTE, a drop in the battery endurance can be reasonably expected. Handling the Nokia Lumia 2520 is a pleasure. The rounded edges of the slate make it easy to hold. Its considerable weight however, can potentially cause discomfort during prolonged use. Overall, the Nokia Lumia 2520 deserves nothing but high marks for its build quality and ergonomics. Battery life is impressive too - it complements the tablet's productivity credentials quite well. Following next is a look at the OS of the Nokia Lumia 2520, as well as the manufacturer's exclusive apps.